Is there such a thing as too much denim? I hope not because this spring I have been sewing denim, buying more denim, and planning future projects in denim. And this doesn't include jeans. 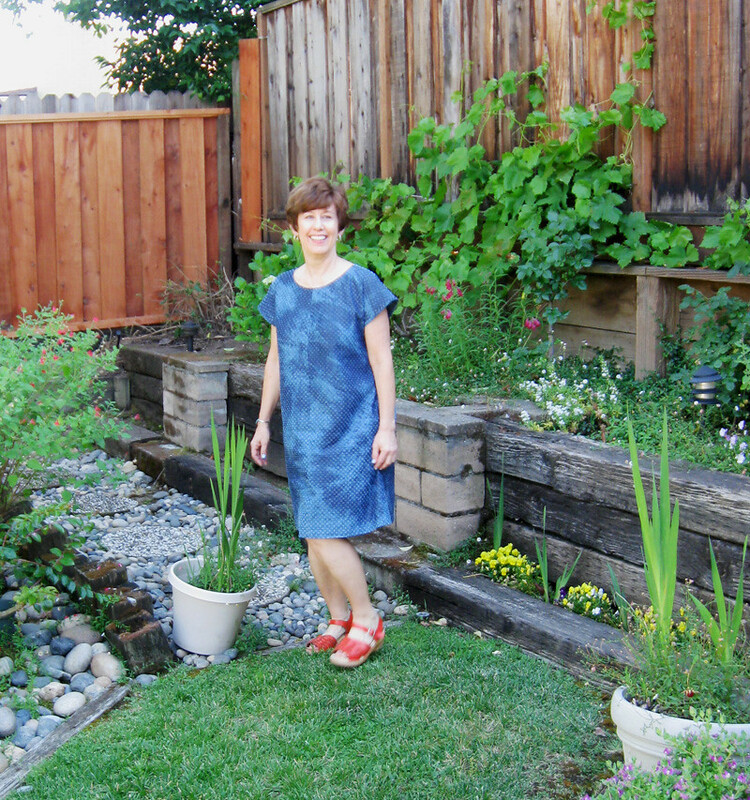 More specifically it's denim dresses among my sewing projects, so they just might become my summer uniform. What is a summer uniform, you ask? 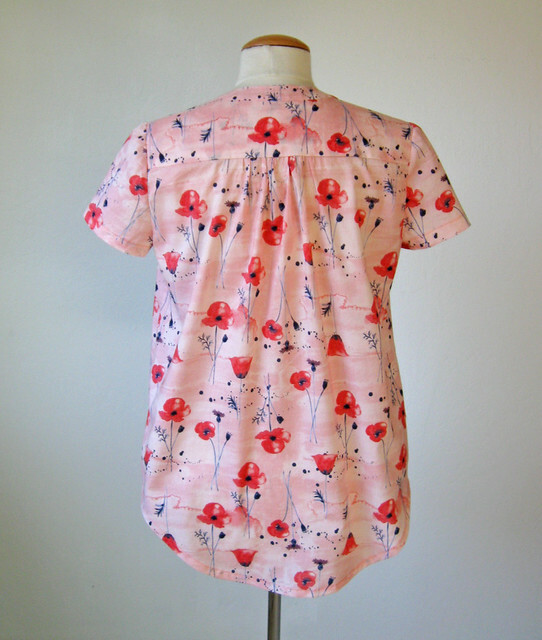 It seems like each summer season I sew something that becomes my go-to item for the duration. 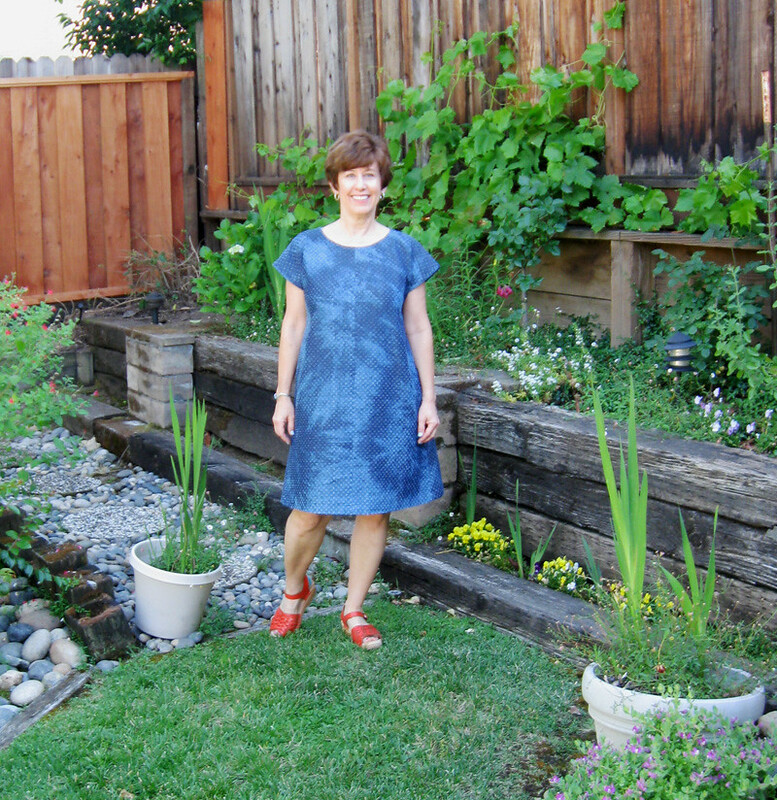 Last summer it was floaty sleeveless tunic tops, in silk or rayon. Some other years it has been t-shirts in bold knit prints. 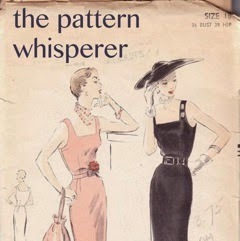 Another time it was jersey knit dresses. Of course most summers include a mix of things worn but do you end up with one or two outfits that you want to wear to everything. Which then means you rack your brain to recall what you were wearing the last time you saw certain friends. Can you get away with wearing the same exact thing? Not the most important issue in the world but for us who sew our wardrobe then variety is part of the package. Which means that my social circle should learn to distinguish between all my denim dresses, because soon there will be at least four. And all fairly distinct - especially this one, entirely due to this fantastic fabric. This is a lightweight denim which is not exactly eyelet but I don't know what else to call it. It has lots of small holes which are a tiny bit frayed that give it a soft feel. Also it is tie-dyed? or somehow dyed with a variegated color so all in all an unusual fabric. That I found last summer at Stone Mountain in Berkeley. If you are quick it looks like they have it listed on their website here. They call the color a marbled bleach effect and that sounds right. Last summer I made a skirt out of this fabric for my friend Alice, see that here. I've been trying to branch out and wear different silhouettes. The "unfitted" dress is one that I see on so many people - what is the right name for this style of dress? Meaning something without a defined waist, less fitted than other styles. Sometimes they are called sack dresses, or maybe a shift dress? or a cocoon dress? I guess it depends on if the column is straight, or perhaps A-line. 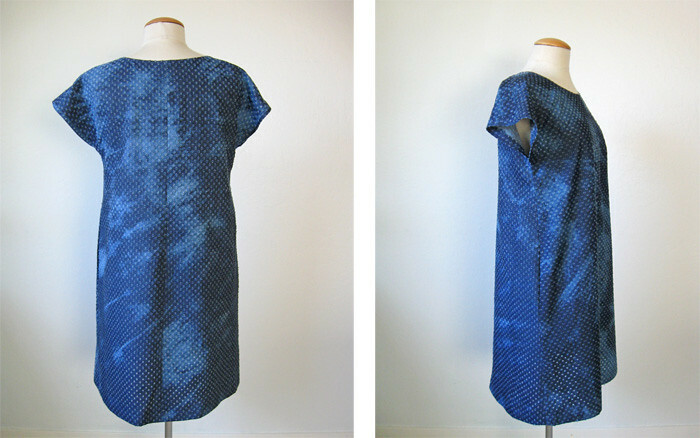 And then the cocoon dresses often have a subtle narrowing at the hemline. 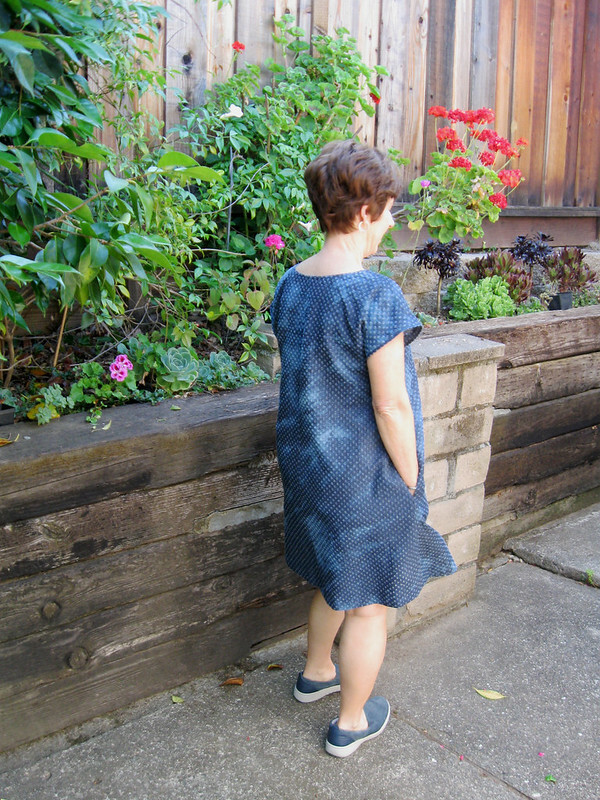 Last year I tried a Burda style dress, (here's the post) and I didn't like that one, mostly due to fabric choice and maybe the shape. But this one is more of an A-line shift style dress and feels really good to wear. And it has built in ventilation for our hot weather :). Here's the dress form view so you can see the silhouette. I did make a few changes to the pattern. Pockets! of course. A dress with this shape and utility needs pockets - and it is an easy thing to add. 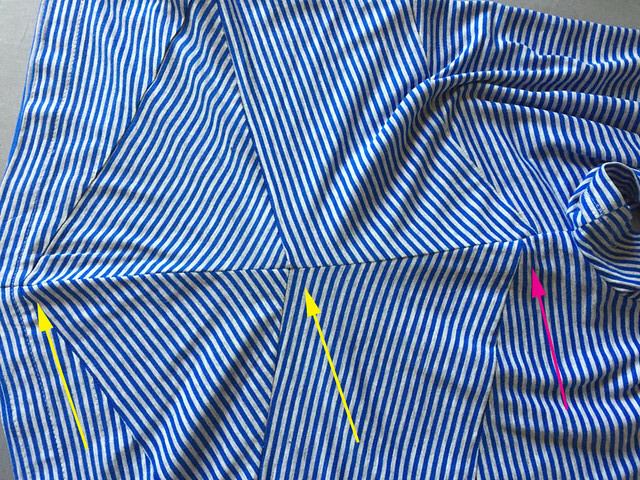 I have a pocket pattern piece of cardboard which I use for any pattern that doesn't have pockets, and sew them on the side seams about 1" below wherever the waistline is marked on the pattern. It works out well. If you are trying to figure out where to add pockets on a dress, try it on and put your hand where you would normally reach into a pocket, then mark the center of that spot with a pin. I think a pocket opening of about 4.5 - 5" seems about right, so place your pocket pieces centered over the pin and you should be good. 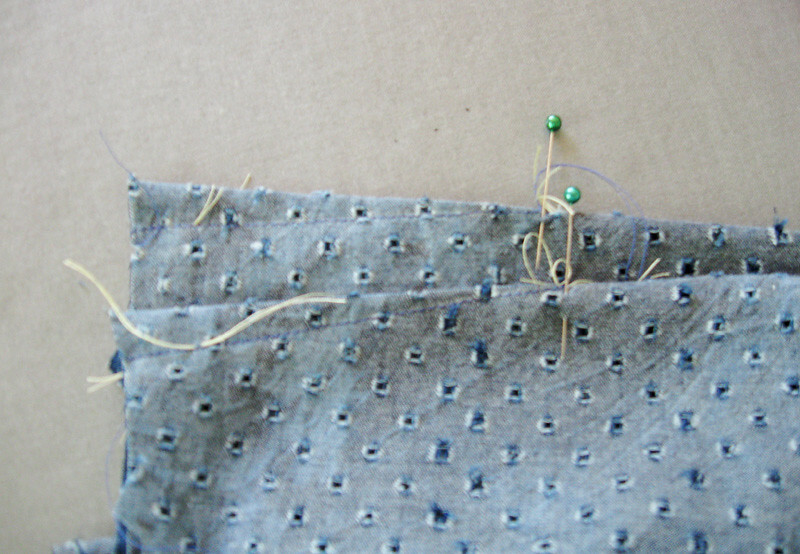 To go with this fabric for the pockets I used some scraps of bemberg rayon lining in navy blue. Also I add a bit on the side seam, particularly of the back dress piece so the pocket lining will not show. Good thing patterns have technical drawings and other info because based solely on that example of the orange top and brown skirt I would have passed this pattern by. Yuck - I just don't like brown very much or brown/orange combos. Looks good on very few people. (caveat - there are some who look very good in this color combo - I can think of a couple of redheads who can wear this and look very pretty). Here's the technical drawing for this pattern. I bought it and made a skirt sample for my class at Hello Stitch, and ended up recommending it as one of the skirt patterns for the class. Interestingly enough so far everyone has chosen this skirt and it is really cute! 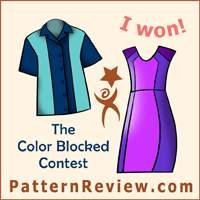 The first week we were looking at the pattern and spoke about how the top had potential - and maybe even the dress. That's why I decided to sew it up, just for fun and to show people at the studio how it looked. The dress/top has bands on the sleeve edges, which are kind of wide - around 2", I did cut them out and baste them on, but they seemed kind of wide and also felt a bit constricting. Actually they would feel better if cut on the bias which they are not. Anyway - I decided it made the sleeves too long, I liked it better with more of a cap sleeve look. So the sleeves are just double turned and stitched. The neckline has a bias cut binding. The center dart is just about the only design feature on this and adds a bit of shaping. I figured that the darts need to match so I measured them to make sure I sewed the length of each dart equally. I hadn't so I went back to make sure they were. But in this fabric they don't even show. Changing up the shoes for a different look - not my fav with these coral clogs, I like it better with my slip on sneakers. And I do have to say that I get a faint impression of mid-50's housedress with this style. I guess it's important to maintain a 21st century attitude (with cell phone and coffee in hand at all times) in order to look modern. That's the scoop on my latest denim obsession. 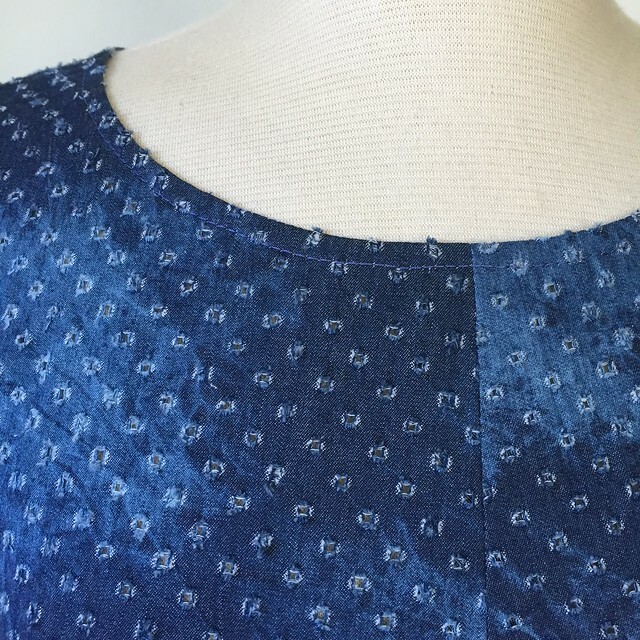 Here's a sneak peek on my Instagram of the next denim in my sewing queue. OK - gotta run. Last week I bought some more plants at the junior college horticultural department end of semester plant sale and they have been sitting on the front porch. I just have to find a good location. 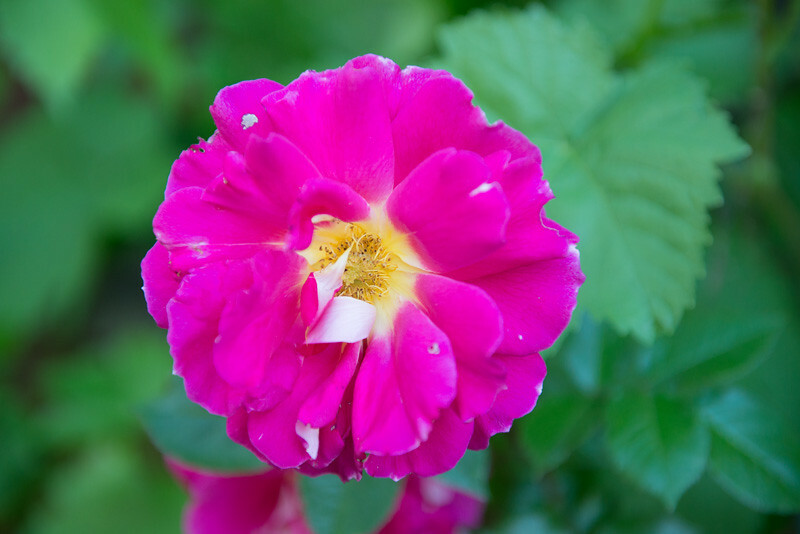 Today's garden photo, a rose that I thought was is called Lipstick but now I'm not sure. I'll have to look in my gardening binder - which sounds more organized that it is. Actually a 3-ring binder where I chuck in all the tags, labels, receipts and articles that go with stuff I buy or accumulate. Anyway what a color! It's a lazy Sunday afternoon so what better time than to sit outside under the patio cover eating strawberries, watching the hummingbirds zip by and catch up with a random threads post. As usual my notebook has plenty of ideas scribbled down. Scribble being the operative word. I have famously bad handwriting - such that often I can't decipher what I have written. You would think that would motivate me to go a little slower and try to make my notes clearer but no. Which means I had one jotting that said "shopping online or in the store, mbnolpdd.sgubprdd. I have italicized the incomprehensible part of my note. What wisdom or pithy observation was included in that attempt at words we will never know but it probably had to do with the recent economic news about the not so slow decline of many retailers. It's a mixed bag, supporting retail shops. I like to support local business, and it's quite convenient for all of us when they have a web shop as well, so that no matter where you are you can buy from them. Plus I'm not the biggest fan of shopping as a pastime (actually it is so not my thing). I'm more of a strategic shopper - have a goal, find or don't find and get out. However I did wander into the Anthropologie store the other day - there is a new multi-level store nearby, which actually took over a spot where there previously was a Barnes and Noble bookstore - so take whatever commentary on society that provides. In any case, I wanted to tell the sales people that "hey - I wore so many of these styles when I was in high school" thus proving that everything comes back in style. They have a lot of cute stuff and actually are good for getting ideas, plus I saw so many things that to my sewing eyes leapt right out of the pattern books or indie pattern shops. (time for me to trot out my oft-repeated phrase - there are no new patterns!). I did see something that sparked my interest enough to snap an iPhone pic. 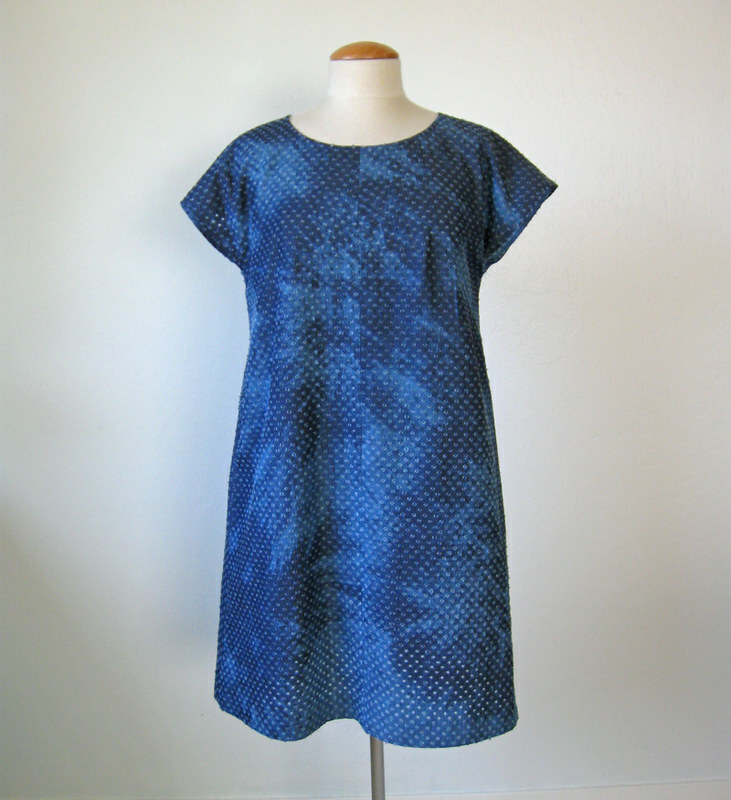 It is a simple enough denim shift dress which has appliqués of other colors of denim. Super cute. It was right next to another one that also caught my eye, at a mere $545 check this one out. A mix of suede and denim pieces. And so easy to make. (File that in the one of these days I might get around to it category:) This summer I have so many denim projects in the works - and I saw this video on the Refinery29 website the other day about how jeans are made, here's the link to it. Including how they get all those holes and artfully placed slashes all over the jeans. I've always thought buying jeans with rips, holes and sanding seems ridiculous - perhaps my N. California bias is showing but I prefer original Levi's jeans or something similar that you have to actually wear into what you want them to be. That's what we did when I was 16 and some habits stay with you! Here's my question for other stitchers this week: why don't people try on things as they sew them? By that I mean in order to make adjustments before finishing. It seems like I saw a number of people sewing things up and then noting the fit problems - many of which seem like they could have been adjusted while the garment was being made. Particularly sleeves that are too long, or a skirt that is too wide. Straps that are in the wrong place. Waist seams that are too low. How about a wrap dress tie that is too long? We can't magically add fabric when something is too small or too short but a lot of thing sto do with "too much" can be adjusted as you go. I think once you move past introductory sewing patterns and start to tackle more complex things then the desire to complete the project (which is totally understandable!) can supersede the opposing desire to slow down, check the fit and adjust. I know, tweaking and adjusting the fit is not really the most fun, the achievement of a perfect placket or a crisp collar is so much more rewarding. But the investment of time and money in the garment merits a bit of double checking as you go to get a finished time that you will be happy with. On that same point - basting is your friend. I think machine basting is a really good way to construct most any garment. Yesterday at Hello Stitch Studio in the skirt class I taught I was extolling the benefits of basting and hopefully convinced a few to try that for their next garment, at least for the crucial fit points. Pattern talk: it's no secret that I love a pattern with multiple views. Or multiple garments within one pattern. 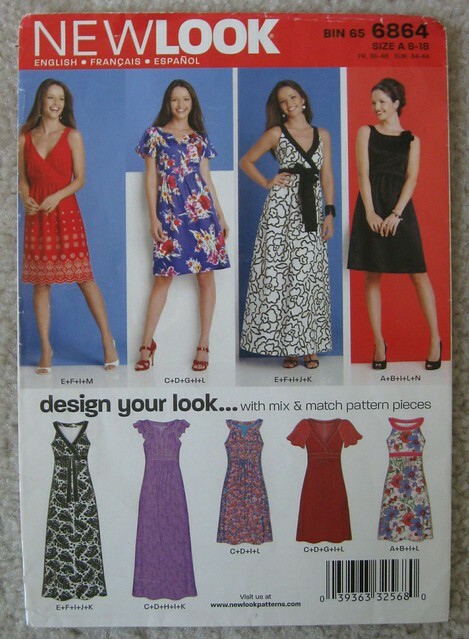 I'm kind of surprised that indie pattern designers don't put out more (or any) of these patterns. I wonder why? Sometimes there is an expansion pack released later which is additional expense. Perhaps the logistics of creating a pattern and packaging/instructions is a lot to tackle but I perceive more value with a pattern with perhaps top, skirt, dress etc. is there. . Vogue patterns have a lot of this type, with multiple pieces or views, and so does Simplicity for that matter. Here are a couple examples. 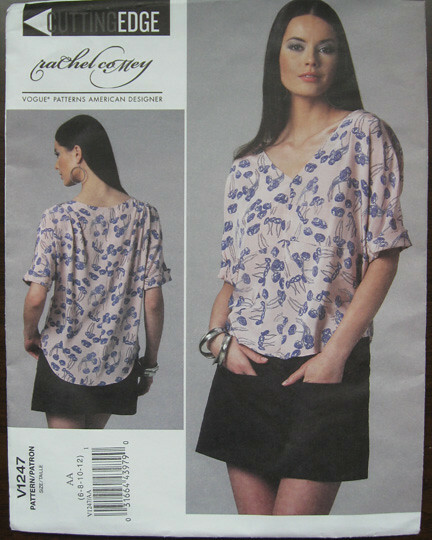 For my skirt making class one of the patterns I suggested was this one, Butterick 6182. You can guess I'm not a fan of the color palette in the top and skirt but we all were really pleased with how cute the skirt is. I said I thought the top had possibilities and maybe even the dress. And after some sewing last week I can say it does - will post the finished version soon. So what do you think of this new Amazon Echo Look which they call a "hands free camera and Style Assistant"? I think it sounds like a nightmare! I suppose there are people who want advice from a variety of sources including - dare I say - a robot. But aside from all the issues with a wi-fi enabled camera taking photos in your bedroom, it just sounds like more ways to dress like everyone else. Don't do it, people! Get creative, unique and bold with your choices. That's why we sew, right? 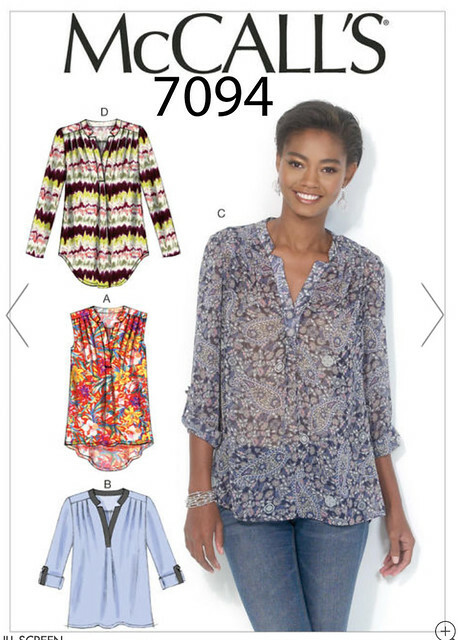 So you don't have to limit yourself to the ready-to-wear choices available. Back to my actual sewing. A few weeks ago when I posted this McCalls pattern t-shirt I showed how I lowered the front seaming so it was in the right place for me. Thus the upper part of the diagonal seaming didn't match up but since it was a knit I could ease/stretch to make the side seams match. Someone noted that I should have also adjusted the back to make the front and back exactly the same - however the idea is to adjust only the front, and have no change in the back. I wanted to revisit that and show that the seaming matches up perfectly along the side, and is only off at the top near the sleeve where it will not show. This is intentional as that is the place where the space is needed. So if anyone was wondering about that pattern and not sure about that adjustment give it a try. Do you feel the online sewing world is slightly fractured these days? A lot of people have noted that they find they are blogging less, or commenting less, and/or tilting towards Instagram to connect with other sewers. I do post on IG and get some great sewing inspiration by seeing what people are posting but I don't like reading/commenting there so much. I bet like a lot of people, IG is something you look at on the run - so a quick glance and it doesn't really penetrate into your thoughts, and it has something of the firehose effect, just a blast of photos passing by making it difficult to remember or go back to anything interesting. I wonder what the next development will be? I love reading so blogs are my preferred category. Once in a while I might click on someone's video within their blog and I always think "get a move on" If I see the length of the video is more than 2-3 minutes then nope - I could read multiple posts in that time. Just too slow for me. What about you - videos, do you watch? Ok that's plenty of my opinions and observations for one day. Sometimes I read over these Random Threads and hope that I don't come off as a too cranky. 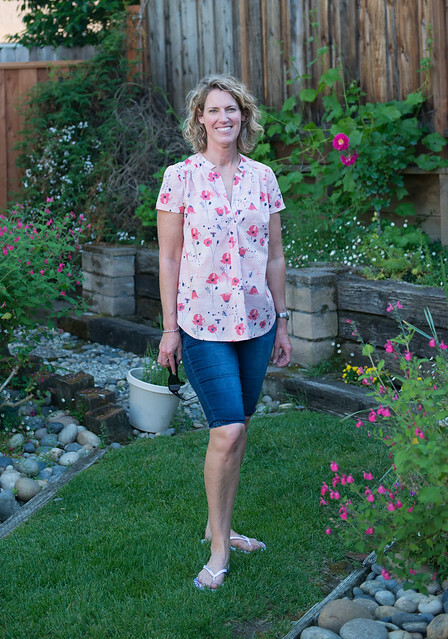 There's so much great online content for those of us who sew but it is kind of fun to see if the stuff that I notice is noticed by anyone else. What have I been sewing? A few things for sewing clients which are notable enough to have a post soon. I am on a denim kick as I mentioned earlier so here's a sneak peek of something I referred to above. If this fabric looks familiar its because I used it for a skirt for my friend Alice last summer and liked the fabric so much that I bought some for myself. This one has turned out to be a perfect match of unusual fabric with the pattern so I am HAPPY with this one. How about this for today's garden photo. Alice took this one with her professional camera and it really shows. What a gorgeous photo. 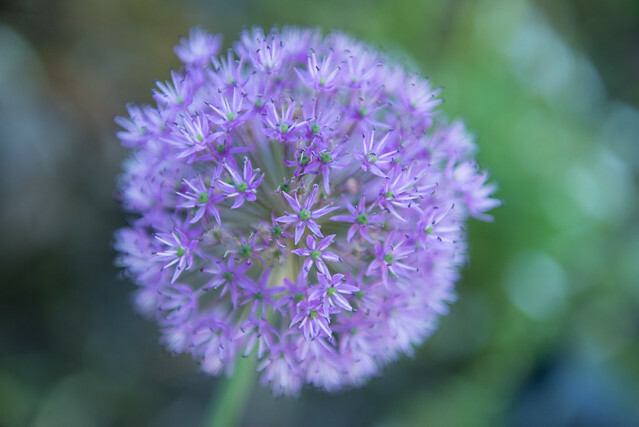 Also - I didn't plant this allium, it just appeared in the flower bed. Sometimes in a bag of bulbs there are some randoms but this was a lovely surprise. Might have to look for these next year. Where do you buy fabric? The web has opened up every possibility to us all, and I'm like many of you - jumping from one site to another because you saw a great fabric on an IG or blog post. I'm sure a lot of us are disillusioned with the chain fabric stores. It seems the fabric they sell, while sometimes useful, is kind of the lowest common denominator of fabric choice. At the same time I am coming around to the idea of supporting local and small business owners - particularly when they are selling products for so many of the things I love, be it fabrics, garden supplies, books, the special produce market in my neighborhood or the hardware store with the helpful guys who know how to fix everything. 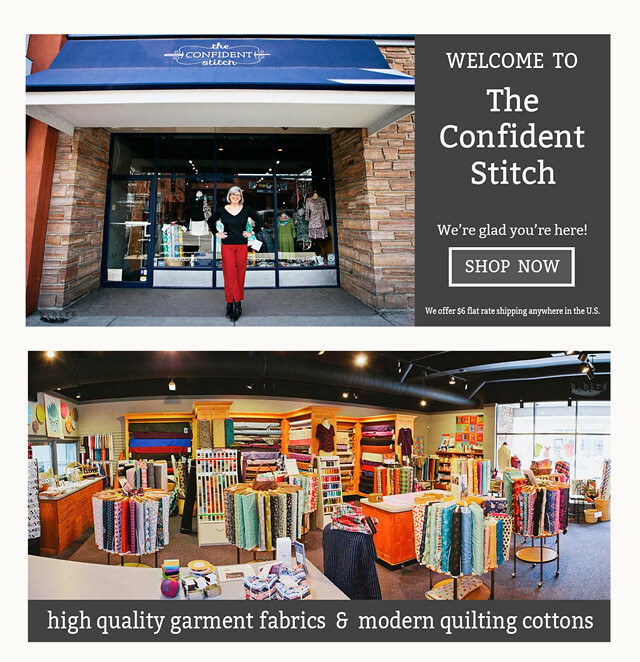 Which is a long way around to introduce a fabric shop, The Confident Stitch, owned by Kate who I met a few years ago when she came for a sewing and fitting lesson. She is originally from my corner of the bay area but moved years ago to Montana and has now fulfilled her dream of owning a fabric store. I don't think I will every make it to Missoula but happily we all can order from their lovely selection. 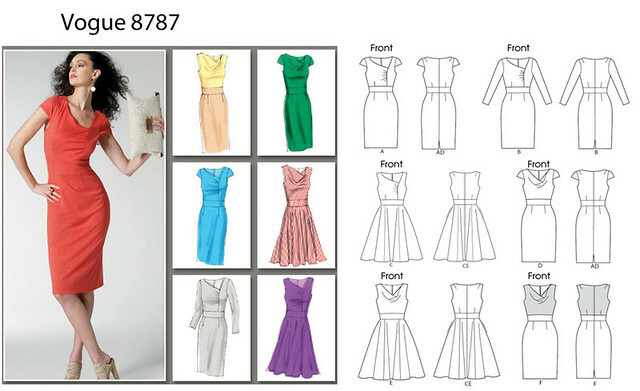 I like the way she lists the fabrics on the site, the photos show the color and drape of the fabric. 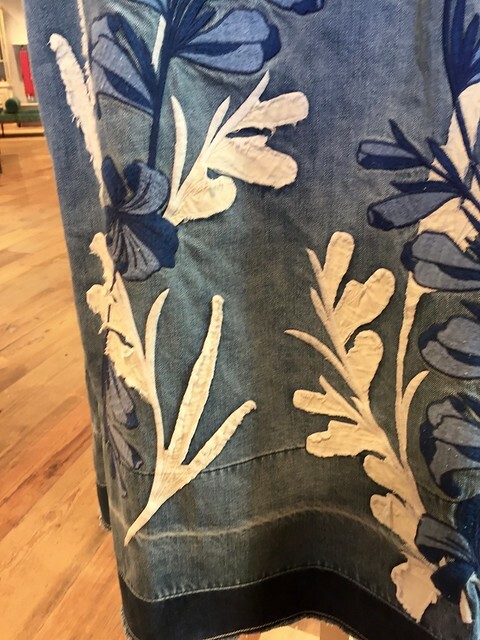 I saw some interesting Japanese fabrics and even the ever elusive tencel denim (I love tencel-cotton blends and in denim colors they are great for a wear-everywhere shirt dress.) But for a coat and jacket maker like me I was really pleased to see the pressing tools listed - they sell a 2-in-1 Tailor board very similar to one you have probably seen on my blog. Plus lots of marking tools, like Chalkoner chalk markers and Frixon pens. If you have been lamenting that you can't find these tools near you give a look at The Confident Stitch website. Fabric - Kate offered to send me something from their website so I chose a couple of cotton lawns that I had seen in person as I met the fabric designer (who is based here in my local area). 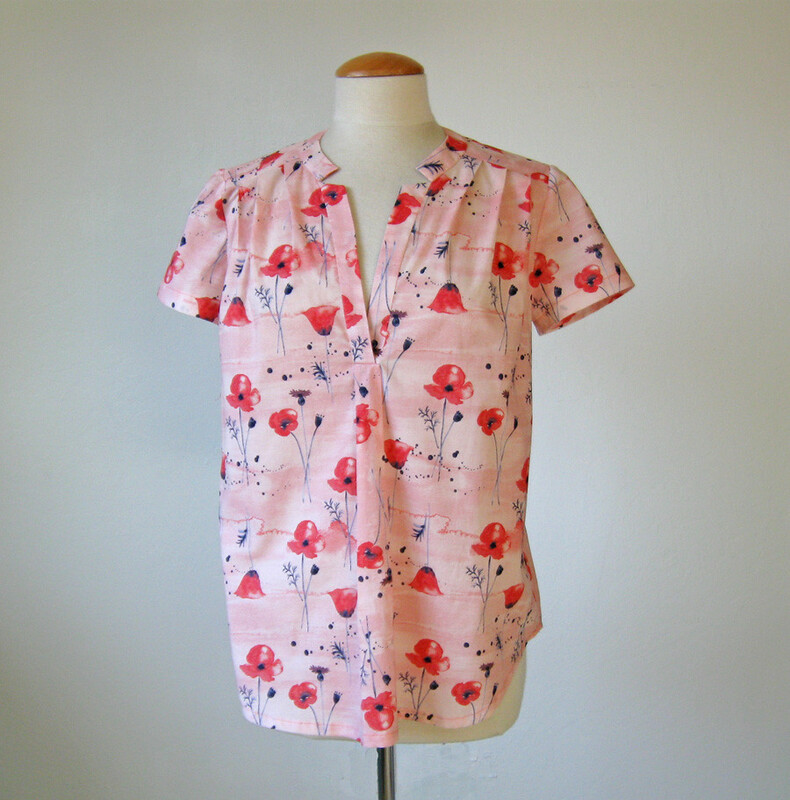 First up is this dreamy floral print, the poppies evoke California (our state flower) but the color way is a bit different than the usual poppy prints with the pink background. It reminds me of Japanese porcelain. I decided to try out a new pattern, McCalls 7094. 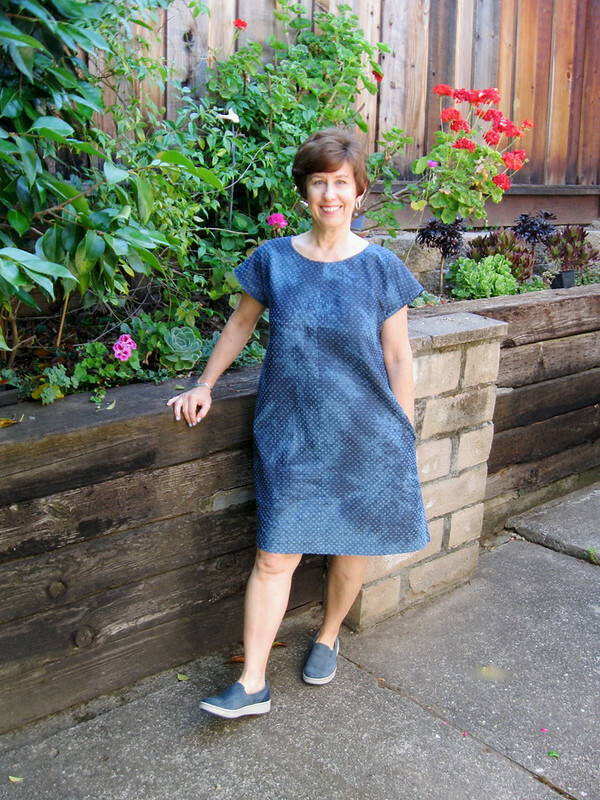 I've been on a tunic top kick lately as I will be teaching a Sew a Tunic Top class at Hello Stitch Studio in Berkeley which starts next week, so I made a few different patterns to check them out. 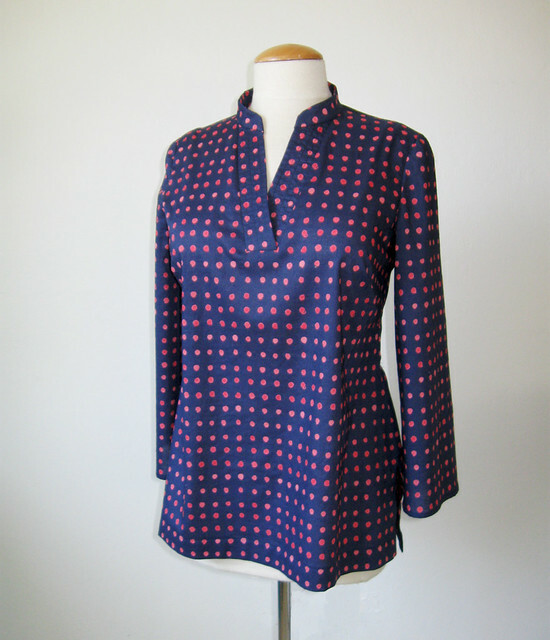 This pattern has pleats at the shoulder which I like, and a sewn-on placket plus an interesting collar that meets at the top of the placket. However I will say that this part is a bit tricky to sew. It's one of those areas where you have to stay-stitch and then snip the fabric to the stitching, and then apply the placket and collar precisely so they meet and create that v-notch on either side of the neckline. It looks nice and this fabric had enough body to deal with that little minefield but I think in a silk or something that ravels like linen it would be a nightmare. Do you ever make something and think it is really pretty then try it on and it's "just not you"? I don't have that happen very often but when you are on a kick to try new silhouettes you encounter some that just won't work. I felt like it was both much fabric and and a bit frumpy on me. 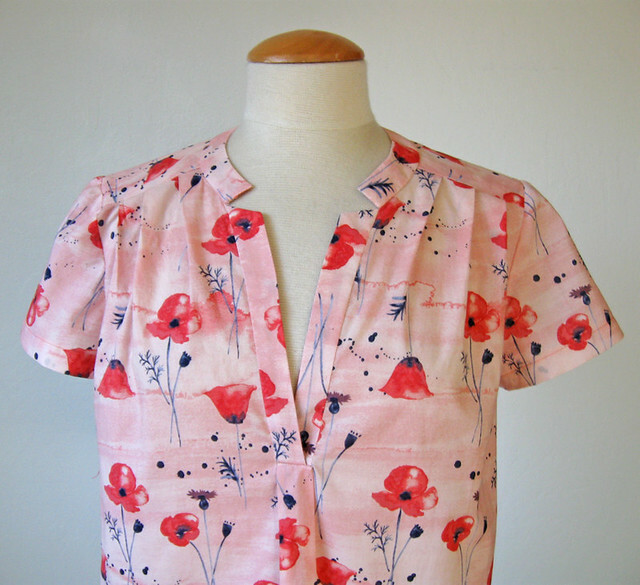 But I loved this fabric - so mentioned to my pal Alice that I had made a new top which she might be able to wear to work, an extra pretty scrub top if you will. When she came over she said, "oh no, that won't be for work, that is going in my actual wardrobe. And it looks great on her! I'm coming to the conclusion - when in doubt about my sewing choices - give it to a tall friend and it will be fine :) Or try to grow a few inches myself. Which is probably not going to happen. Here's a closer look at the neckline and fabric. 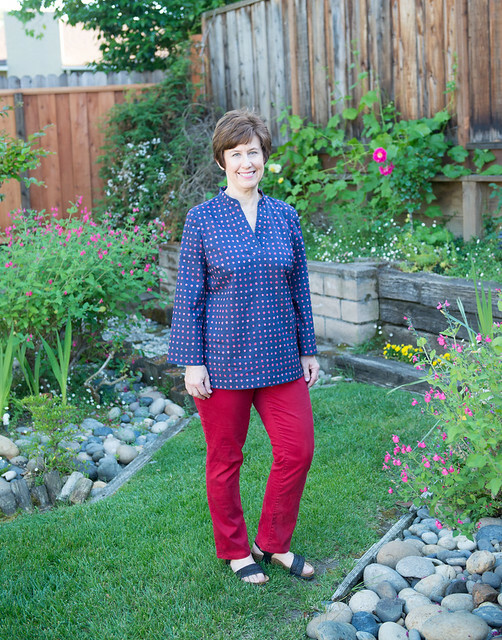 I also chose a coordinating fabric from the same designer, and used that to make up my favorite tunic top pattern (New Look 6688 which I have sewn several times already, in eyelet, silk, silk, and rayon. So version five is in cotton lawn and the name of this fabric is Sun Spots - which I didn't realize but is kind of fitting for me. This one is great with my red jeans but I am seriously tempted to remove the sleeves and have a top I can wear in our hot weather. However I think I will refrain and then have a cute casual top to wear a little bit now and then again in the fall when it cools off. 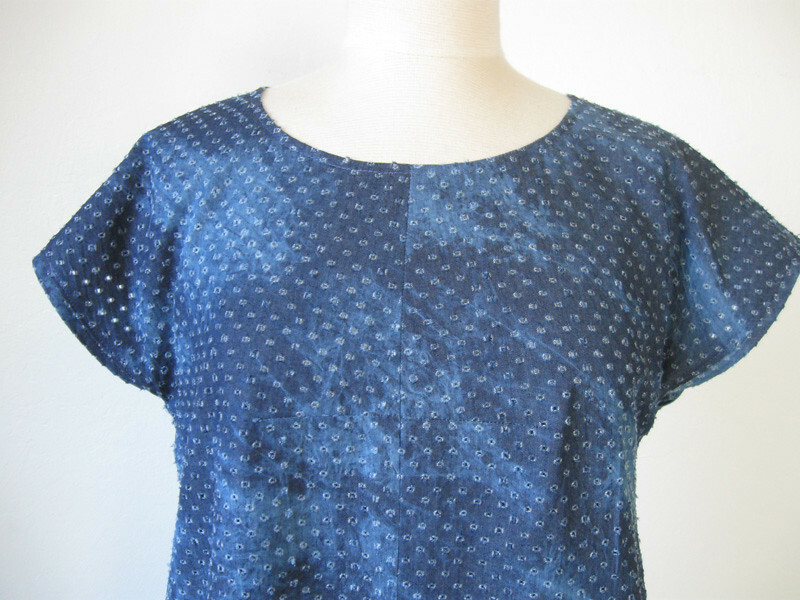 I love the painterly dots of this print. The pink lawn is just a tiny bit softer than the blue dotted one, I did wash both but probably with another wash it will soften up some more. By the way, both these cotton lawns are organic cotton. I've seen a summer quilt that incorporated these plus other fabrics from the same designer and it is gorgeous. So that's the scoop on The Confident Stitch - check them out. Thank you to Kate for sending me this fabric at no charge and I'm sure I will find more to purchase on her site. 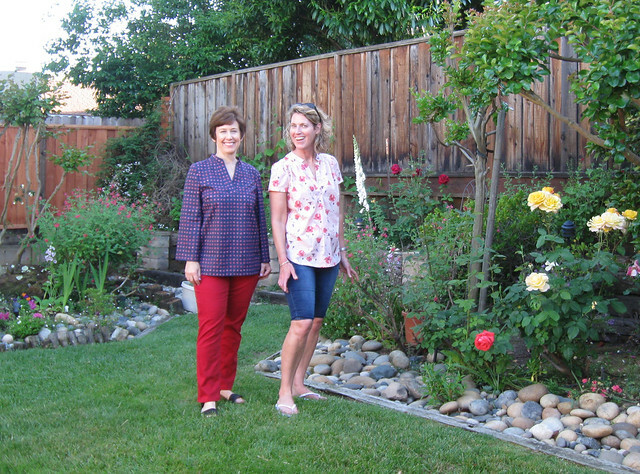 Here's me and Alice and a corner of my garden in full bloom - this is the best time of year for a California garden, still so green. Up next - I have been sewing quite a few things for others, some I will share including a plaid coat I am working on, the boucle fabric is an unraveling mess but the result is turning out so well. today's garden photo, a close up of that yellow rose shown above. 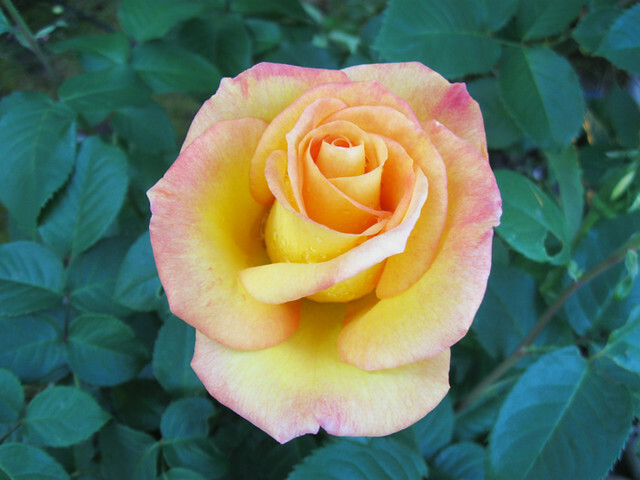 It starts out a bright yellow touched with pink and fades to a pale almost white.